About ESIC Exam: Employees State Insurance Corporation (ESIC) is a National Level Entrance Examination conducted by ESIC to the aspiring graduate for posting in Clerk, MTS, UDC, Stenographer, Paramedical Posts. 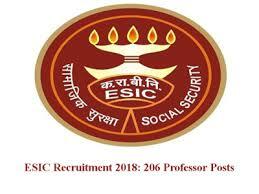 About ESIC: Employees State Insurance Corporation which conducts the ESIC Recruitment Exam is an Insurance Corporation. It was established on 25th February 1952. The organization is social security and health insurance scheme for Indian workers. The ESI Act 1948, encompasses certain health-related eventualities that the workers are generally exposed to; such as sickness, maternity, temporary or permanent disablement, Occupational disease or death due to employment injury, resulting in loss of wages or earning capacity-total or partial. ESIC Full Form: ESIC stands for Employee State Insurance Commission. Scope: ESIC Exam is conducted to hire the skilled graduates for the post of Clerk, MTS, UDC, Stenographer, Paramedical Posts through ESIC Recruitment 2019. Date of Release: ESIC released the official notification on 21st December 2018. How to Apply: Candidates are required to apply online on the official website http://www.esic.nic.in/recruitments. Pay scale: The pay scale for ESIC Recruitment 2019 is INR 21,000 /- per month which varies according to the post. Notifications: ESIC Recruitment 2019 notifications was released on 21st December 2018. Application Form: Application Form of ESIC Recruitment was released on 21st December 2018 and the last date to submit the Application Form will be on 21st January 2019. Admit Card: The Admit Card will be available for the candidates online from 28th February 2019. Examination: ESIC Recruitment 2019 will be conducted Online i.e. Computer-based Test (CBT) on 8th March 2019. Job Posts: ESIC Recruitment is conducted in order to hire skilled graduates for the post of Clerk, MTS, UDC, Stenographer, Paramedical Posts through ESIC Recruitment Exam which is held in all over India once in a year. Reservations: Reservations are also being provided for SC/ ST and OBC candidates. Educational Qualification: The candidates must have passed 12th/ Intermediate from a recognized Board of Education. Age Limit: the age limit for the candidates is 18-35 year. Any applicant beyond this limit is not applicable. Nationality: The candidates must be a citizen of India/ Nepal/ Bhutan/ Tibetian are also eligible to apply for ESIC Recruitment 2019. Paper-1: English Language, Numerical Ability, General Awareness, General Intelligence. Paper-2: Typing letter in Ms word, PPT presentation, Preparing Database in MS Excel. Structure: ESIC Recruitment 2019 will be conducted online i.e. Computer-based Test (CBT) on 8th March 2019. Papers: Paper-1 will have objective type multiple choice questions (MCQ) for 200 marks for a duration of 2 hours and Paper-2 will have 50 marks for a duration of 30 minutes. Post-exam: The candidates who qualify both the exams (paper 1 and paper 2) will be called for Personal Interview. Application Fee: Application Fees for General/ OBC category is INR 500 and INR 250 for SC/ ST/ PWD/ Departmental Candidates/ Female Candidates/ Ex-Servicemen which will be refunded with bank charges before appearing for the examination. Payment: All the candidates must pay the Registration Fee online through Debit Card/ Credit Card/ Net Banking. Availability: ESIC Admit Card will be available for the candidates online from 28th February 2019. Download: The candidates have to submit their Application Number, Date of Birth and Security Pin to download the ESIC 2019 Admit Card. Id Proof: Candidates must carry a government id proof along with the ESIC Admit Card to the Exam Centre. Get more information about the hall ticket, please visit ESIC Admit Card section. Result Date: Results will be updated on the official website by the conducting authority on 31st March 2019. Download: Candidates can download the scorecard of ESIC 2019 by using their Registration Number and Password. The scorecard of ESIC 2019 containing the sectional and overall score will also be released after the declaration of the result.